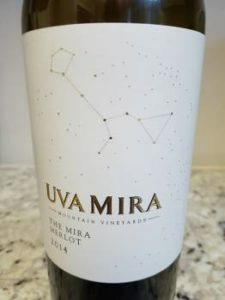 Uva Mira is the Helderberg property owned by Toby Venter, CEO of Porsche South Africa, where Christian Coetzee, previously of KWV, is crafting some impressive wines. The Bordeaux-style red blend called O.T.V. 2014 rated 91 points in the RisCura Red Hot Wine Awards earlier this year so what of the single varietal Merlot and Cab from the same vintage under The Mira label? Matured for 18 months in French oak, 50% new. Red and black berries, hints of fresh herbs and tobacco plus a little chocolate. Plush on the palate – concentrated fruit, enough freshness and soft tannins. Very pleasing and approachable, it’s a bit of a guilty pleasure. Matured for 18 months in French oak, 50% new. Very ripe dark fruit plus oak spice on the nose. Rather chunky on the palate – doesn’t lack for power but short on detail.